Do I need to bring anything on the tour? What are the weight / luggage restrictions? Are all tours and transfers private? Can infants and children be taken on the flights? Can seaplanes fly in all weathers? How do I pay for the tours? We are only a group of two, can we still go on a seaplane tour? 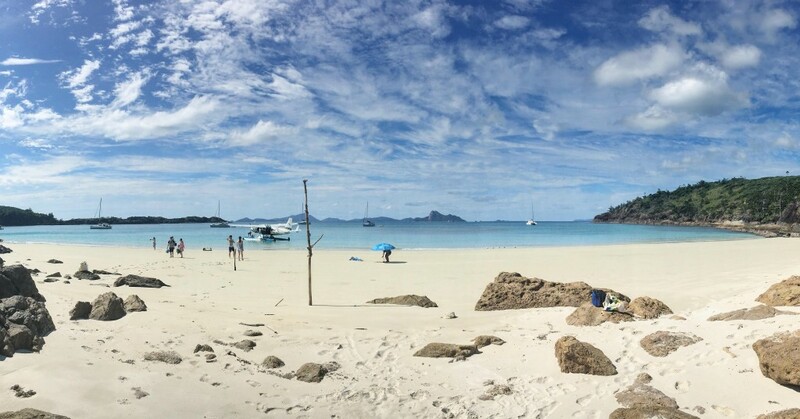 I have been offered a relocation to Chance Bay due to Whitehaven Beach being inaccessible for seaplane landing due to weather, what does this mean? Please bring your own towels, sunscreen and children’s toys. For legal and safety reasons all passengers are weighed prior to boarding – individual weights in excess of 110kg will incur an extra seat surcharge. Combined body weights per two passengers bookings in excess of 180 kgs will incur an extra seat surcharge. Maximum per seat weight is 130 kgs. Luggage restrictions apply to all Transfers. Helicopters, 1 medium size suitcase not weighing more than 20kgs and 1 standard test cell size carry-on bag not weighing more than 10kgs per person. Seaplanes, 1 standard test cell size carry-on bag not weighing more than 10 kgs per person. Touring luggage restriction, 1 bag not weighing more than 5kgs p/p. Single seats are available on a standby basis at 6pm day prior to travel only. The Reef Comber tour is NOT suitable for non-swimmers or children 0-13, no life guard is on duty. For credit card bookings your card will be pre-authorised in line with our cancelation policy and then charged on the day of travel. Hamilton Island Air accepts Visa, MasterCard and American Express (American Express attracts a 3% surcharge). All seaplane and aeroplane tours are subject to a minimum of 4 passengers to fly. However bookings of two guests are welcome, additional bookings will be joined to tour to confirm by 6pm the night prior to tour. Due to the nature of seaplanes, optimal water conditions are required for water landings. Sometimes due to wind direction and strength, Whitehaven Beach becomes inoperable for our seaplanes. On some occasions, an alternative of Chance Bay can be offered to guests. Located on the South East of Whitsunday Islands this sheltered bay can offer an extra landing option after your standard scenic flight. Not found the answers you need? Get in touch!